The lists found at String trimmers Direct are continuously updated to keep them fresh and relevant. 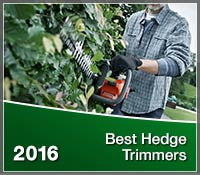 String Trimmers Direct has released their results for the best ranked hedge trimmers of 2016 using their advanced algorithm designed for determining the best models according to real-time reviews, rankings, and recommendations. The online retailer and reviews site currently lists more than 50 hedge trimmer models and publishes even more reviews from actual online shoppers. The online string trimmer & hedge trimmer superstore uses a custom algorithm that generates a specific letter grade for every individual hedge trimmer, allowing StringTrimmersDirect.com to now publish the most comprehensive 2016 hedge trimmer lists online. Hedge trimmer shoppers have varying opinions of what it means to be the "best" hedge trimmer. StringTrimmersDirect.com publishes lists that can be sorted three ways. Shoppers can sort hedge trimmers by best selling, top-rated, or expert recommended models. Furthermore, shoppers can filter the results to significantly narrow the selection to what they want. One category wasn’t good enough for String Trimmers Direct. The retailer and reviews site created separate categories for each of the different styles of hedge trimmers, ranging from small electric trimmers to large walk-behind wheeled trimmers. Most best-selling lists are lucky to be updated once per year, often times recommending discontinued trimmers that were sought after the year before. String Trimmers Direct's lists, however, are updated in real-time. This means that they're always displaying the most popular models of the year. “The greatest factor is that real hedge trimmer users are influencing the algorithm on a daily basis. If someone doesn’t agree with a hedge trimmer's letter grade, they can simply submit a review and instantly affect the ratings,” said Munoz, who works directly with the leading manufacturers and actual customers before recommending the highest quality trimmers. StringTrimmersDirect.com doesn’t require a membership or registration. The retailer’s ongoing goal is to provide shoppers with free information, helping them pick the perfect hedge trimmer for their personal needs. "We're incredibly passionate about providing the most information and assistance to the consumer. That's why we insist on sharing this valuable information for free," said Munoz.